The UNCG men’s basketball team is on its way to the Southern Conference Tournament Championship game after defeating Wofford 77-73 in Sunday night’s back-and-forth semifinal matchup. The Spartans will take on the winner of No. 3 East Tennessee State and No. 7 Samford at 7 p.m. on Monday night at the U.S. Cellular Center in Asheville. The game will be nationally televised on ESPN. With the win over Wofford, the Spartans improve to a program-record 25-8 on the season. Their nine-game winning streak is the longest in program history at the NCAA Division I level and the third longest winning streak overall in the 50-year history of the program. Monday night’s game will be the Spartans’ third appearance in a SoCon Tournament Championship and their first since 2005. A win guarantees UNCG an NCAA Tournament berth. 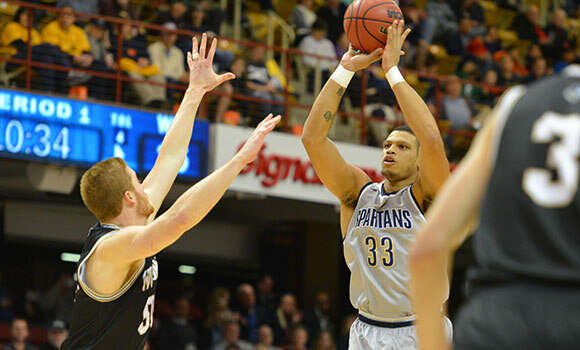 Visit uncgspartans.com to read the full game story, and follow UNCG Athletics on Facebook and Twitter to stay up-to-date on men’s basketball.